Presented by Bay Area radio legend Chuy Gomez! 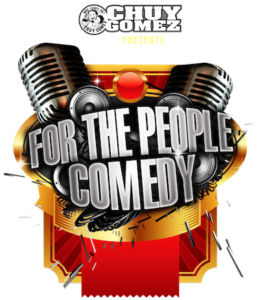 For the People Comedy is a collective of artists who share a common goal of producing colorful events fueled by creativity and laughter. Founded by Frankie Quinones in 2008, the group is known to bring together the best local comics along with special guests from around the nation, always maintaining a diverse lineup. High energy shows filled with laughter and music sell out shows throughout California, from San Francisco to Ventura to San Diego. Past guests include: Joey Guila, Kevin Camia, Shen Wong, Scott Capurro, Marcella Arguello, Shanti Charan, Emily van Dyke, Tramane Webb, Chris Estrada, Kabir “Kabeezy” Singh, Cory Loykasek, Donny Divanian, Butch Escobar and many more. Check Show Dates to find out when For the People Comedy will be near you.